We are beginning to get a clearer picture on what our weekend storm system looks like. The interesting thing is that is that is it takes shape it looks a bit like our past storm systems, where the track is diving a bit further South and the low pressure center itself doesn’t look all that strong. There is however a big difference with this storm and the past couple we’ve seen in April and late March; temperatures! At this point in time, the low pressure center is weakly organized over the four-corners region. With a storm this weak, we would expect it to not strengthen until it moves across the mountains and into Eastern or Southeastern Colorado or even Northeastern New Mexico. 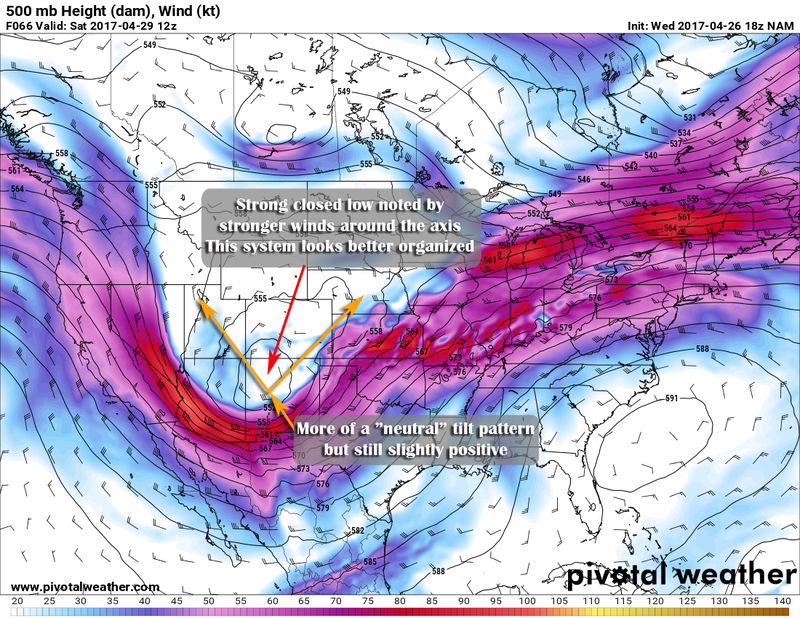 The tilt of the closed low pressure is what we call “positive tilt” which is illustrated by a forward leaning jet stream pattern. 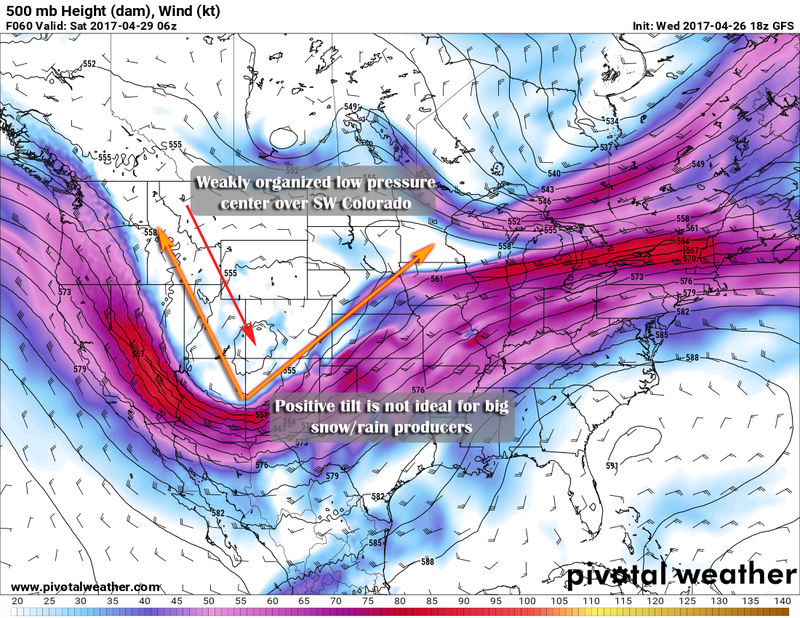 This type of setup is not ideal to bring big rain or snow chances to the Eastern part of Colorado. The winds with the positioning and strength of this storm at this point in time will be Southwesterly which are downsloping (drying) winds. The low hasn’t moved all that much, it is slightly further East of the previous model run denoting that it hasn’t moved all that quickly. 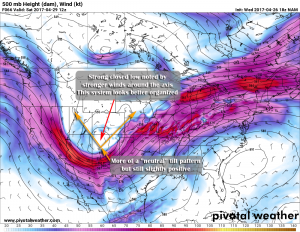 This is something to watch because if the storm ends up moving slower it could signal stronger chances for precipitation if all other ingredients line up. Models go on to show the storm evolving and strengthening but dropping a bit further South than we’d like to see. This doesn’t matter too much at this point in the game but it is something to keep an eye on in case the trend continues. The track and speed will ultimately play a huge part in who sees what in terms of rain or snow and the amounts. 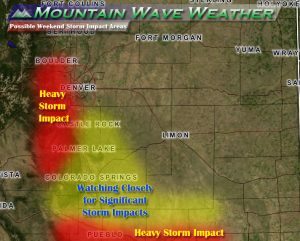 Possible Storm Impact Areas – These areas and impact severity may shift over the next 24-48 hours, but this is an initial look. With the data we have available now, there are a couple of areas we are keeping a very close eye on in terms of storm impact. Areas along the front range foothills could see significant snow accumulation. There is still a lot of uncertainty with this area, air temperatures and warm ground will play a role on how much snow sticks. 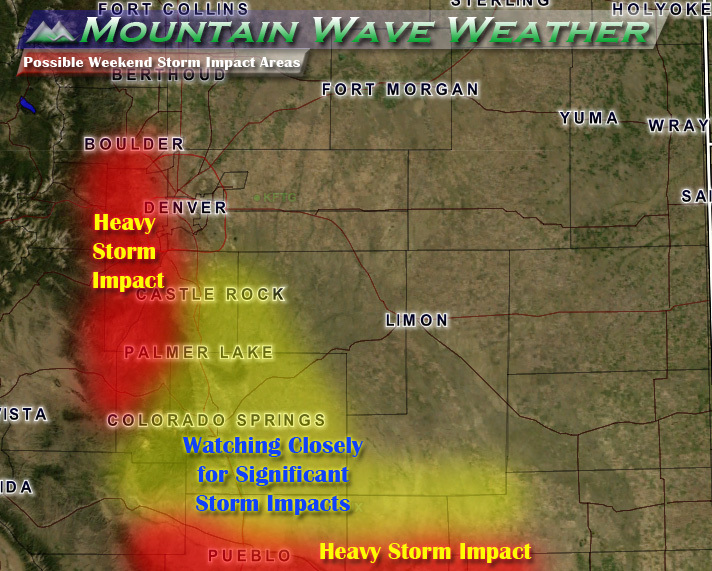 Southeastern Colorado looks to get significant precipitation out of this event if the storm stays on its current track. There is still some uncertainty as to how much falls as snow and how much as rain. Very cold temperatures will be present Saturday, Sunday and Monday nights. Any exposed tender vegetation will be severely affected if not covered. Sprinkler systems and faucets above ground have a high likely-hood of freezing and possibly bursting. If you can, drain and detach these on Thursday or early Friday. Winds may cause visibility issues as the storm moves through. We have no indication of blizzard conditions at this time but we are keeping a close eye on it. For areas that see snowfall, it will be heavy and wet. If significant snowfall occurs, expect damage to tress and possibly power lines. Again, we are keeping an eye on which areas could see the most snow. This is still a fluid forecast and much can change in the next 24-48 hours. 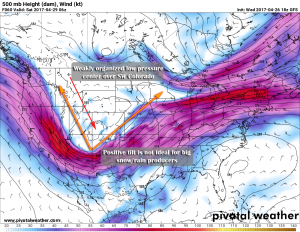 These spring storms are notoriously difficult to forecast, but just keep in mind it’s better to be prepared than not. Stay tuned here for more posts on this storm Thursday and Friday along with forecast snowfall totals, locations and impacts.